The California Gold Rush was a pivotal time in American history. Soon after gold was discovered in January of 1848, thousands upon thousands of gold seekers converged on the once pastoral Mexican province. If your ancestors were part of the massive rush of people searching for gold, it may be a difficult task to locate information on their whereabouts during the early years of the state's existence. Unlike the "civilized" Eastern states, it was some time before untamed California established an efficient record-keeping system of vital, property and governmental records. However, there are still many genealogical resources to use during your research. To understand how to find information on your Gold Rush ancestor, it is important to know the origins of the California Gold Rush. During the Mexican-American War that had started in 1846, Mexico ceded Alta California to the United States. California became a U.S. territory in 1848 and a state in 1850. On January 24, 1848, one week before the Mexican War ended, gold was discovered by a carpenter named James Marshall who was building a sawmill on the south fork of the American River. Marshall shared the news with his employer, John Sutter, owner of Sutter's Fort. Sutter feared a gold rush would ruin his plans to expand his agricultural empire, so he attempted to keep the discovery secret. However, word excitedly spread about the important find, and miners started to make their way to the region. It took nearly a year for the news to spread to the East Coast, but President James Polk officially confirmed the discovery in December of 1848. The largest single migration of people the world has ever known had begun and in 1849 an estimated 90,000 miners arrived in California, By the end of 1849, California's population increased from only 20,000 inhabitants to nearly 108,000. Traveling to California from the Eastern states was not an easy task, and the gold seekers usually chose three methods of travel. One of the routes was to sail around the southern tip of South America, called the Cape Horn route, a trip that usually lasted four to eight months. A shorter route, of two to three months, required passage on ships bound for the east coast of Panama. The eager adventurers crossed the Isthmus and boarded another ship that would carry them to San Francisco. However, the greatest number of people arrived from the Eastern states by covered wagon trains, usually by the Oregon-California Trail route. Leaving from the Missouri frontier, the 2,000 miles journey west took three to seven months. Many of the miners were unprepared for the rigors of gold mining. Usually they mined for a year or two, and then returned home. Some did stay behind to live in California permanently. However, throughout the 1850s, fortune seekers continued to arrive. Since the most accessible gold had already been found, they turned to more advanced methods of retrieving the gold. They often joined large mining operations. Others chose instead to become merchants, ranchers or farmers. By the early 1850s, an increasing number of women and children made the trek to the Golden State, and the country became more settled. Gold Rush ancestor research is the same as any other type of genealogical research. Begin with yourself and work backwards, from the known to the unknown. Start with materials you already have at home or are stored in relative's homes. Do diaries or journals mention that your ancestor participated in the Gold Rush? Perhaps you may find an obituary of your ancestor, mentioning his experience in the Gold Rush. Letters written to the folks back home may yield fascinating details of the trip. Determine of any repositories or archives hold manuscripts or diaries of your Gold Rush ancestor. Search online databases such as the Online Archive of California (OAC), the National Union Catalog of Manuscript Collections (NUCMC) or the Library of Congress website, "California As I Saw It:" First Person Narratives of California's Early Years, 1849-1900. For Chinese ancestors, see the American Memory's The Chinese in California, 1850-1925, a collection of 8,000 images and pages of primary source materials documenting Chinese immigration to California. The Oregon-California Trails Association website has a searchable database "Paper Trail" with essential information from all known documents written by emigrants during the overland journey. Other repositories to search for manuscripts or diaries are the Bancroft Library at the University of California, Berkeley, the California Historical Society and The Huntington Library. Research for your ancestor in published indexes of wagon train or ship's passenger lists. While these indexes do not list every person who traveled to California, you may be lucky to find not only your ancestor's name, but those of the people who traveled with him. Charles W. Haskin's The Argonauts of California contains lists of 27,000 emigrants who arrived in California before 1850. Louis J. Rasmussen's California Wagon Train Lists, 5 April 1849 - 20 October 1852, contains names gleaned from newspaper extracts. Rasmussen also extracted names of ship passengers in his four-volume San Francisco Ships Passenger Lists. The SF Genealogy.com website contains extracted ship passenger lists from the Eastern states, Panama and San Francisco. The website for the Maritime Heritage Project lists over 20,000 passengers who arrived in the Port of San Francisco in the nineteenth century. For a list of those who departed San Francisco from September 30, 1850 through December 31, 1852, extracted from the San Francisco Call, see Peter E. Carr's five-volume San Francisco Passenger Departure Lists. Search local newspapers where your ancestor resided before he headed to California. You may find an article that describes your relative's trip out West, or valuable birth, marriage and death notices. Check with the local library in the area to see if microfilm of early newspapers is available. California newspapers may also contain information about your ancestor's stay or mention local events in which your ancestor was a participant. The California Digital Newspaper Collection contains over 400,000 pages of significant historical California newspapers published from 1846-1922, including the first California newspaper, the Californian, and the first daily California newspaper, the Daily Alta California. California newspapers that have not been digitized must still be searched on microfilm. For early newspaper holdings, search the catalog of the California Newspaper Project website. Check censuses taken at the time of the Gold Rush to find where your ancestor resided in California. 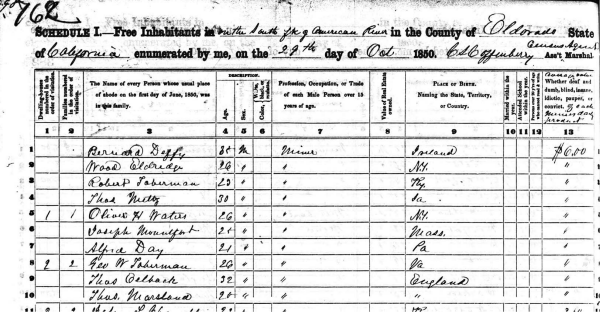 The 1850 census was the first federal census to enumerate the entire household, as well as listing each person's birthplace. In the Gold Rush counties, there are numerous miners enumerated. However, approach census research with caution. Because miners tended to move swiftly from place to place in 1850, the census taker might have easily missed them. Be aware that Contra Costa, San Francisco and Santa Clara Counties are not included in the 1850 census due to their being lost or destroyed. By the time the 1852 state census was taken, many Gold Rush pioneers had left California. While "staking a claim" is a well-known term, miners could not legally own a mining claim until 1866. Contact the County Recorder of the area where your ancestor resided to inquire exactly what records they have available. There are six different volumes of records in which mining claims are recorded - notice of location/mining claims, mining claims, water rights, bills of sales and agreements, patents, and grantor/grantee deeds. For more detailed information on mining claim research see "How to Research Mining Claims" by Tim Purdy. Continue your Gold Rush research in libraries, societies, and archives where your ancestor originated or settled. You may locate biographies of your ancestor that are included local history books. These history books are usually found in regional history sections of libraries. It may be fruitful to search for these histories near or in the area where your relative lived toward the end of his life. Many of these county histories are also available on Family History Library microfilm. For California research, check with libraries, societies, and archives or their websites that focus on the seven original Gold Rush counties - Butte, Calaveras, El Dorado, Mariposa, Sutter, Tuolumne, and Yuba counties. Later counties added that included gold rush activity were Trinity, Nevada and Placer counties. The websites may describe collections which may or may not be searchable on the Internet. Cemetery transcriptions may also be included. To find societies in California, see the California State Genealogical Alliance website. County libraries and archives websites may be found through searches on an Internet web engine, such as Google. The California State Library has an immense collection of resources that includes city directories, county histories, photographs and California history books. The Sutro Library in San Francisco, contains one of the largest genealogy collections on the West Coast. The California Information File, or CAIF, a microfiche collection by the California State Library is also a valuable collection to search for Gold Rush-era ancestors. The CAIF started as a series of 720,000 3 X 5 cards with some 1.4 million references to information in California newspapers, county histories, periodicals, and biographies. Volunteers recorded the content until 1985 when the collection was put on microfiche. The information is cataloged alphabetically by subject. The CAIF is available in most major California university and county libraries. A portion of the file, containing over 50,000 records, can be searched online. Due to the turbulent early years of California's statehood, few Gold Country counties made an effort to record birth, marriage and death records. Check with County Recorder's websites and the Family History Library online catalog to locate surviving vital records. Often local societies publish Gold Rush-era newspaper indexes regarding vital records. For example, The Placer County Genealogical Society website contains a newspaper index to Placer County births and deaths prior to 1905. Discovering stories of your ancestor's adventures during the Gold Rush can be exciting and fulfilling. Even if you do not find any information on your ancestor, you will still learn much about this fascinating time in American history. Carr, Peter E. San Francisco Passenger Departure Lists, Vol. 1-5. San Bernardino, CA: The Cuban Index, 1991. Holliday, J.S. The World Rushed In: The California Gold Rush Experience. University of Oklahoma Press, 2002. Rush for Riches: Gold Fever and the Making of California. Berkeley and Los Angeles, CA: University of California Press, 1999. Rasmussen, Louis J. California Wagon Train Lists, 5 April 1849 - 20 October 1852. Colma, CA: San Francisco Historic Records, c1994. San Francisco Ship Passenger Lists, Vol.1-4. Colma, CA: San Francisco Historic Record and Genealogy Bulletin, 1965-67.